Ah, the holidays! Beside trying to close out your year, send out gifts to clients, you’re also deciding whether or not to dole out a holiday bonus to your employees. As you’re weighing your bah-humbug tolerance, consider this: Your decision could have a bigger-than-intended influence on employee morale. Just think about the possible side issues: How much of a bonus is enough? Should it be spread out equally among the team, or divided by seniority, hourly status, or performance? Does everyone get one? If I don’t have much to give, should I give anything at all? The emphasis on the monetary value of bonuses has the potential to distract leaders from the real business purpose of a gift: To acknowledge employee contribution to inspire continued dedication and good work. And we haven’t even talked about whether it’s good for your business to compensate your employees in this way! It’s true that money plays a part in accomplishing this goal—but only a part. In fact, it is the other parts of a holiday bonus—the intention and the message—that can make the biggest impact with your team. I’ve had two very different experiences with holiday bonuses, and both impacted my relationship and dedication to the companies I worked for at the time in starkly different ways. My first holiday bonus experience happened about six years ago. After running point on a new and lucrative product development project, I was curious to see if my late nights and hard work would be reflected in the form of a bonus. The holiday party came and went. Then Christmas break. Then New Year’s. Nothing, not even a word about bonuses. One random day in January I opened up my online checking account to find that there had been the equivalent of an extra month’s pay directly deposited. When I asked my manager about it the next day, he informed me that was my holiday bonus as he picked up his phone to start dialing his next appointment. On the train home that day, I wondered why I didn’t feel better about my bonus. It was a nice bit of unexpected money, but it didn’t elicit any emotional reaction at all: it was just more money. I stuffed it away in my savings account and moved on, almost forgetting it was there. Seven months later, I indifferently quit to start my life as a freelance writer and didn’t give the company much thought again. When I received my next holiday bonus three years later from a freelance client-turned-employer, I was startled at how different the experience was. After wrapping up our final project for the year, my boss took me and our small team out for an extended holiday lunch. As the meal ended and we prepared to leave, he stopped us and said that he had something for everyone. He looked at the man seated directly next to him at the table and, in front of the whole team, thanked him for his work that year, listing several key roles he had played and what his skill set brought to the company’s culture. When he was finished, he handed him a small gift bag and shook his hand, before looking at the next seated person and repeating the action. When he got to me, I was surprised by how powerful it felt to be publically acknowledged and thanked in a genuine manner. The contents of the gift bag my boss gave to me with his thanks included a $50 P. F. Chang’s Gift Card, a check for $500, a few pieces of chocolate, and a handwritten holiday card reinforcing the words spoken at lunch. The total monetary value was thousands less than my first bonus experience, but its intangible impact was immeasurably more powerful. It fostered a sense of connection and inclusion that I don’t think any amount of money could create. 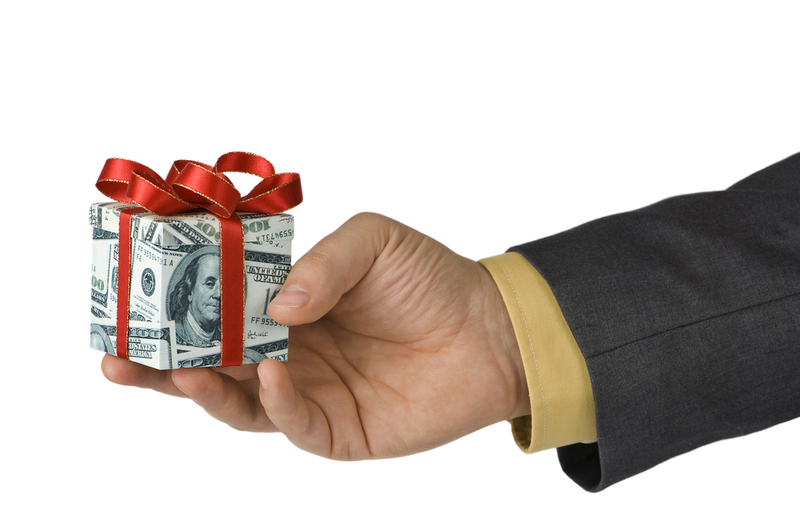 As you prepare to distribute your holiday bonuses this year, I strongly encourage you to think beyond the dollars and cents of the transaction. Take a moment in the hustle and the bustle of the season to think about how you can highlight the intention and message the bonuses represent, and you will reap the rewards for months to come. The truth is that your people would love a few extra bucks to help make ends meet or pick up that flat screen TV they’ve been eyeing. But what they are really looking for is an indication that their effort, accomplishments, and basic presence make a difference. What they are really looking for is a human connection in an impersonal business world. As a result of this experience, and a hundred other, smaller moments of acknowledgment, I have made it a priority to remain involved with the second company, even though my career has evolved. I can’t imagine not participating in the work or contributing to the team. And every year, when the holiday lunch rolls around, I am reminded that my time, effort, energy, and involvement is acknowledged and appreciated.